Add the given tcl::command to this group's overload list. Get this group's fully namespace-qualified command name. Returns a string giving the command's proper usage, including overloads. Find the named command, if it exists. Find the named command, after following any namespace aliases. Build a new tcl::command object that will be hooked into a tcl::command_group. Represents a set of overloaded tcl::command objects. Definition at line 58 of file commandgroup.h. Returns null if no such command. DO NOT DELETE the pointer returned from this function! Its lifetime is managed internally by tcl. Definition at line 320 of file commandgroup.cc. Definition at line 328 of file commandgroup.cc. References rutz::fstring::c_str(), tcl::interpreter::eval(), tcl::interpreter::get_result(), and rutz::sfmt(). 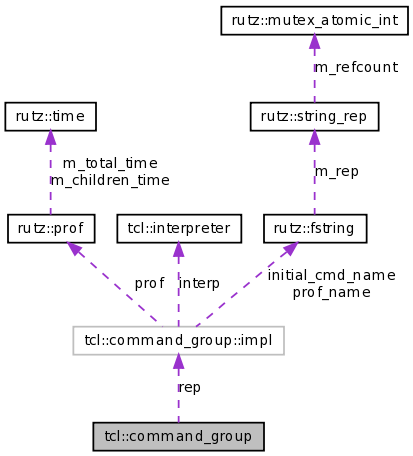 If there is already a tcl::command_group for the given name, then the new tcl::command will be hooked into that tcl::command_group as an overload. Otherwise, a brand new tcl::command_group will be created. Definition at line 346 of file commandgroup.cc. This page was generated Wed Dec 3 06:56:48 2008 by Doxygen version 1.5.5.